Croydex has teamed up with one of the UK’s best-loved artists, Steven Brown for a new range of McZoo shower curtains and toilet seats. 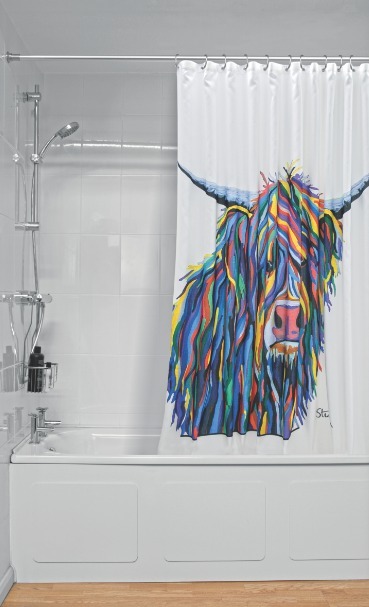 The collaboration between the 100-year-old bathroom accessories specialist and the Ayrshire artist sees the launch of shower curtains and Flexi-Fix toilet seats featuring the iconic Angus McCoo, and giraffe double-act, Francie and Josie McZoo. 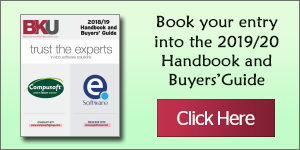 They are the brainwave of Croydex Project Manager, Margaret Carruthers who is a fan of the brightly coloured designs and spotted a gap in the accessory market. 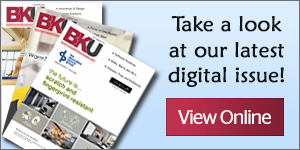 Croydex Managing Director, Nick McGrellis believes the new range will appeal to the consumers in the UK and overseas, helping to further drive the Hampshire-based manufacturer’s export sales, which have consistently recorded year-on-year growth. The shower curtains (RRP £29.98) are manufactured from water-resistant fabric with a cling-resistant weighted hem. Easy to clean, they are machine washable and come ready to hang with twelve corrosion-resistant metal eyelets. Part of the Flexi-Fix range, the McZoo toilet seats (RRP £29.98) promise to never come loose or slip over time thanks to an innovative hinge system. Both are quick and easy to fit: simply position the seat, press the hinges in place and tighten bolts for a sturdy no slip installation. The patented V plates provide a huge range of adjustment to fit the fixing holes of any standard toilet. The seats fit toilet pans with fixing hole centres from 110mm to 200mm – far greater than the 145mm to 165mm specified in the European Standard EN33. They can also be adjusted forwards or backwards by up to 60mm to ensure the seat lines up with the front of the toilet pan. They are supplied with both bottom fix and top fix fittings, making them easy to fit to any type of toilet pan. This wide range of adjustability ensures the hinges will always align with the toilet pan holes and because the seat can also be installed from above or below the pan, it always fits. Collapsible supports hold the hinges away from the pan while the seat is aligned. Once a little pressure is applied, the supports collapse and the high strength self-adhesive pads grip the toilet pan for a secure fit which will not come loose or slip. As the grip pad technology is a pressure sensitive adhesive, it is easy to re-position the hinges during initial installation if fine adjustment to the selected position is required. Finally use the top or bottom fixings supplied to secure in place.